Microsoft Corp. is introducing Xbox Music, the first all-in-one music service that gives you the freedom to stream custom-created playlists for free, subscribe to all the music you want or download-to-own your favourite songs. Through the power of the cloud, it integrates the music experience across your tablet, PC, phone and TV. With more than 30 million songs in the global catalogue, Xbox Music begins rolling out around the world tomorrow on Xbox 360 and later this month on Windows 8 and Windows RT PCs and tablets and on mobile phones, starting with Windows Phone 8 at launch and additional platforms later. Xbox Music makes music simple by offering immediate and comprehensive discovery across the different types of devices you own, free streaming music on Windows 8 and Windows RT tablets and PCs, the ability to purchase songs and albums, a music subscription, and artist-based radio. Xbox Music isn’t just a listening experience that shows your tracks in spreadsheets and lists. Taking full advantage of every screen on which you enjoy music, Xbox Music elevates your music experiences with striking visuals. As you listen on your tablet, PC, phone or TV, your screen comes to life with artist photos, bios, cover art and discography. Whether it’s free streaming on Windows 8 and Windows RT, a subscription on Windows Phone 8 or tuning into a playlist on Xbox 360 — each experience is cloud-based for immediate access to your entire catalogue, making music management simple. With the cloud sync feature, your favourite playlists are no longer held captive by the individual device on which they live. 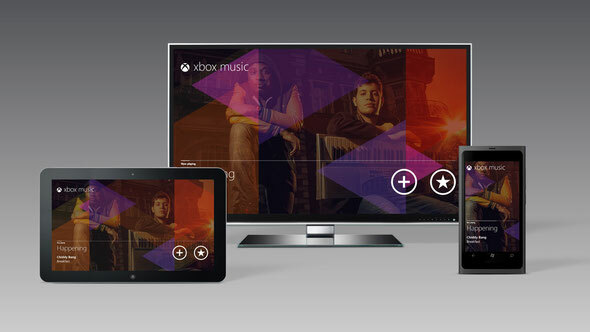 For Xbox Music Pass subscribers, you can create the perfect playlist on your Windows 8 or Windows RT tablet and see it automatically appear on your Xbox 360 or Windows Phone 8. For full info and a list of features, check: xbox.com/music.